In recent years, scientists and conservationists have been working to raise public awareness of a global decline in amphibian populations. Herpetologists first started noting that amphibian populations were falling at many of their study sites in the 1980s. Those early reports were anecdotal and many experts doubted that the observed declines were cause for concern (the argument was that populations of amphibians fluctuate over time and the decline could have been merely natural variation). But by 1990, a significant global trend had emerged—one that overstepped normal population fluctuations. Herpetologists and conservationists started voicing their concern for the worldwide fate of amphibians. Their message was alarming: of the estimated 5,918 known species of amphibians that inhabit our planet, a staggering 1,856 species were listed as endangered, threatened or vulnerable on the IUCN Red List (Global Amphibian Assessment 2007). Amphibians are considered to be indicator species for environmental health: they have delicate skin that readily absorbs toxins from their environment; they have few defenses and can fall prey to non-native predators; they rely on both aquatic and terrestrial habitats at various times during their life cycle. If amphibians populations are in decline, it is likely that the quality of the habitat in which they live is suffering. There are numerous known factors that contribute to amphibian declines—habitat destruction, pollution, the effects of introduced species. Yet research has revealed that even in pristine habitats—those that lie beyond the reach of the bulldozer and crop-duster—amphibians are disappearing at a shocking rate and without explanation. Scientists are now looking to global phenomena for explanations. Climate change, emerging diseases, and increased exposure to UV-B radiation (due to ozone depletion) are all additional factors that could be contributing to falling amphibian populations. Alien Species—Native amphibian populations can suffer decline when alien species are introduced into their habitats. There are a number of ways an introduced species can impact populations of native amphibians. For instance, an amphibian species may become the prey of the introduced species. Alternatively, the introduced species may compete for the same resources required by the native amphibian. It is also possible that the introduced species may form hybrids with the native species and in doing so reduce the prevalence of the native amphibian within the resulting gene pool. 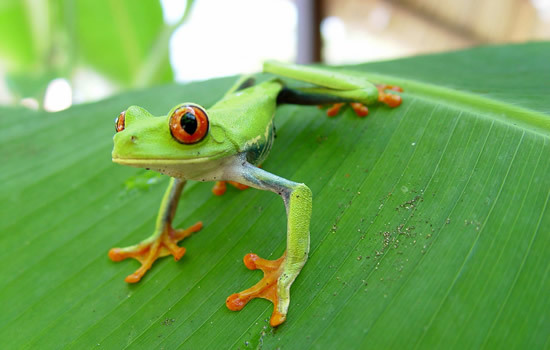 Over-Exploitation—Amphibian populations in some parts of the world suffer decline because they are captured for the pet trade or are harvested for human consumption. 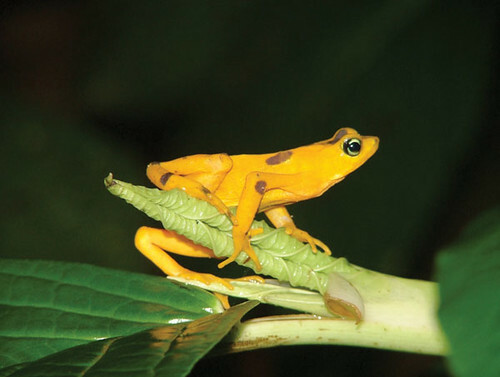 Habitat Alteration and Destruction—Alteration and destruction of habitat has devastating effects on many organisms and amphibians are no exception. Changes to water drainage, vegetation structure, and habitat composition all impact the ability of amphibians to survive and reproduce. For example, the drainage of wetland areas for agricultural use of the land directly reduces the habitat available for amphibians which require aquatic habitat for breeding and foraging. Global Changes (Climate, UV-B, and Atmospheric Changes)—Global climate change presents a serious threat to amphibians because altered precipitation patterns will likely result in changes to wetland habitat on which amphibians rely. Additionally, increases in UV-B radiation due to ozone depletion have been found to severely impact some species of amphibians. Infectious Diseases—Significant amphibian declines have been associated with infectious diseases such as chytrid fungus and iridoviruses. Chytrid fungal infections in amphibians was first discovered in populations of amphibians in Austrailia but also has been found in Central America and North America. Pesticides and Toxins—The widespread use of pesticides, herbicides, and other synthetic chemicals and pollutants has severely impacted many amphibian populations. In 2006, scientists at the University of California, Berkeley found that mixtures of pesticides were causing amphibian deformities, reducing reproductive success, harming development, and increasing susceptability to diseases such as bacterial meningitis. Blaustein, A. and B. Bancroft. 2007. “Amphibian Population Declines: Evolutionary Considerations“. Bioscience Vol. 57 No. 5: 437-444. Collins, J.P. and A. Storfer. 2003. “Global Amphibian Declines: Sorting the Hypotheses“. Diversity and Distributions 9: 89-98. Young, B. E., S. N. Stuart, J. S. Chanson, N. A. Cox, and T. M. Boucher. 2004. Disappearing Jewels: The Status of New World Amphibians. Virginia: NatureServe. Accessed September 5, 2007.